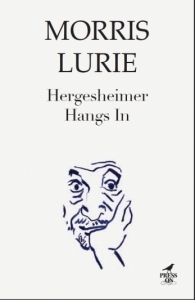 Morris Lurie, Hergesheimer Hangs In (Arcadia/Australian Scholarly, 2011), 184 pages, $24.95. Respect, neatly put, and is followed now with Ramona Koval’s choice of Lurie’s “On Not Writing” for inclusion in The Best Australian Essays of 2011. This piece appears as Chapter 24 of Hergesheimer Hangs In and was coaxed from him by Meanjin editor Sophie Cunningham. This ended the silence. Quadrant played a prominent part in keeping him at it; six of the stories here were published in Quadrant, all of which appear as chapters in the life of Hergesheimer, anyway this volume of it. And new apartments, a building everywhere you look, Hergesheimer turns his back for a minute up goes another architectural beehive, the whole gaudy gamut from millionaire maison grand deluxe to minimum perfunctory shoestring fuckbox (this latter a coinage of Hergesheimer’s own savage devise), whatever, a cramming, a crowding, a shift in how we live, how to live, never mind why, slots, spaces, welcome to the modern world, some section of Hergesheimer mouthing rueful pleasure he won’t be around to see the life being thus assembled, another part all eager eyes questing to see. I could tell you, for instance, the tedium of Talmud Torah, the impossibility of listening to an important serial on the wireless with everyone else talking so loudly and shouting and the only way they know to close a door is with a slam, the fubrenteh (charred) latkes my mother made a specialty of when she wasn’t standing on a chair on top of the table washing the kitchen ceiling, never mind the sexual education which was never mentioned, the toilet training I’m still suffering to this very day. This range of historical perspective, of character built on family personality, is designed to have the reader made fit for the next event. About dysfunctional families, his and most likely yours and mine, the next event is: “We survived.” And shows some continuity of technique, for it’s from “If You Need an Introduction”, written two decades ago, and not included here. to find himself, at a certain corner, passing a certain corner, this busy and bustling certain corner of third and final glimpse or facet once afforded, the record, the rush, the reason, Hergesheimer in humbled discovery seeking still in desperate denial her alive rushing face. Lurie’s 2008 volume, To Light Attained, is, in my own view, his masterpiece, so far. It needed fourteen years to find a publisher. —each time Lurie caring for the reader’s capacity to take in, to keep up, equipped to understand the full meaning of the next event. And “The Story of Father Quentin McGillicuddy’s Rabelaisian Bowel Explosion and the Events that Flowed Therefrom” has this patient take an enema, after days of priming, to a thunderous movement which would close the hospital ward, and persuade him to renounce the sins of the flesh to join a Christian order. This is clever writing at its most excremental. Is my recollection accurate of Spinoza writing something like: “Do not deny a man his religious experience merely because it was due to the condition of his bowels”? John Bryson’s books include Evil Angels.